Listen up if you plan to travel to Williamsburg! 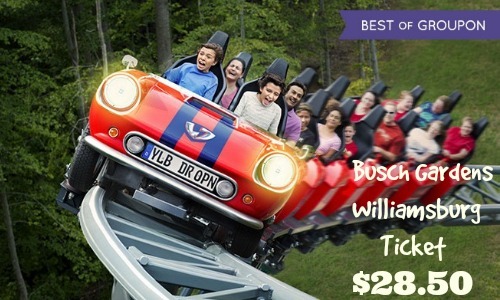 Groupon is offering 50% off the regular price of a one-day admission to Busch Gardens Williamsburg. This deal is available for up to a $77 value making each ticket $38.50! Also, right now new Groupon members can get $10 off with coupon code WELCOME making a ticket $28.50! Offer valid through 3/30. Limit 10 per person & 1 per visit. Ticket expires through 6/26.